At the end of Top Banana, Chikara's season 15 finale, a small girl, couldn't have been older than seven, walked by me. She was decked out in a tiara and the Disney-stylized "We believe!" Crown and Court shirt, completed with a huge, beaming smile on her face. She had a good reason for walking out of the 2300 Arena (formerly ECW Arena) in such high spirits despite the fact that the show probably ended two hours after her bedtime. Kimber Lee left the arena as Chikara Grand Champion. Chikara is not a promotion where women are segregated from men, but it's also not necessarily a promotion where women are considered to be title contenders as a rule. So when the show ended with Lee, who scored the decisive pin for her Crown and Court over Blaster McMassive in the Challenge of the Immortals finals earlier in the night to earn her the three points necessary to challenge for said Grand Championship, as the Champion, that little girl had all the reason in the world to be jolted into exuberance. Someone who looked reasonably like her ended the show supremely victorious. Just when one thinks that Chikara is done surprising and amazing, the company exceeds its expectations. The promotion flirted with putting the Grand Championship around the waist of Sara del Rey, but just when the booking put the Queen in its crosshairs, she accepted a job training the next generation of wrestlers down in Florida for WWE. Since her departure, Chikara, which had received high marks for evolving gender integration (even from this web rag, especially from this web rag), stalled on that front and some might say it has regressed. The Saturyne experiment was a failure for several reasons. One such reason is that she was plagued with mishaps in the ring, mishaps which could be blamed on a mask. She seems to have improved by bounds as the unmasked Hania the Howling Huntress, much in the same way Hunico was a far better worker as Hunico than he is now as Sin Cara v. 2.0. For now though? Having Lee provide that little girl and all the other girls in the audience a shot at representation in the same fantastical world as wrestling ants and Halloween demons and the essence of beefy '80s tag teams distilled and enhanced in a lab somewhere is to be commended. It was satisfaction at its height, especially on a show where satisfaction was guaranteed at nearly every turn. Whether it was the reunification and healing of The Colony or the initial feelgood story of Crown and Court ascending the staircase to immortality, Top Banana had a sense of resolution that poked into the crowd with prescience, a stark contrast to this time last year. Icarus ending The Flood with Thunder Frog's hammer in theory was supposed to be a triumphant satisfaction, and the implications of it did lead to the rise of Kevin Condron's masterpiece of a 2015. However, ending the cycle of murder by continuing it felt fractured. But the ends were not islands unto themselves, as each wrestler on that card felt like they had to put in the extra work in order to make those resolutions, whether satisfactory or even in instances where the rudos were set to triumph, feel earned. The moves looked extra stiff, especially in the torneo cibernetico. Lovelace looking like she's getting murdered on every bump she takes is one thing, and hoo boy, did she put on a clinic of making the other guys look good. Her rag-doll bump on that head whip toss thing Mark Angelosetti did to her looked as violent as anything anyone has ever done in wrestling history. But it was like everyone else took a cue from her and went just a little bit harder. Everyone executing moves did so just a little bit crisper. It's like the roster heard whispers of Chikara's popularity not stemming from in-ring quality, and they felt like they had to go out and prove everyone wrong. In the process, Chikara produced the first show since its comeback that felt like an older, pre-shutdown show. About the only thing missing was a guest star on the level of Kota Ibushi or El Generico, but the show turned out not needing it anyway. Most of the shows since the comeback have been two hour sprints, and I didn't have problems with those because they still felt like they packed bang for their buck. However, when the company can produce a four-hour tome and still feel quick, it has hit the sweet spot. And when that show can make children happy, then the show has hit the sweetest spot of them all. 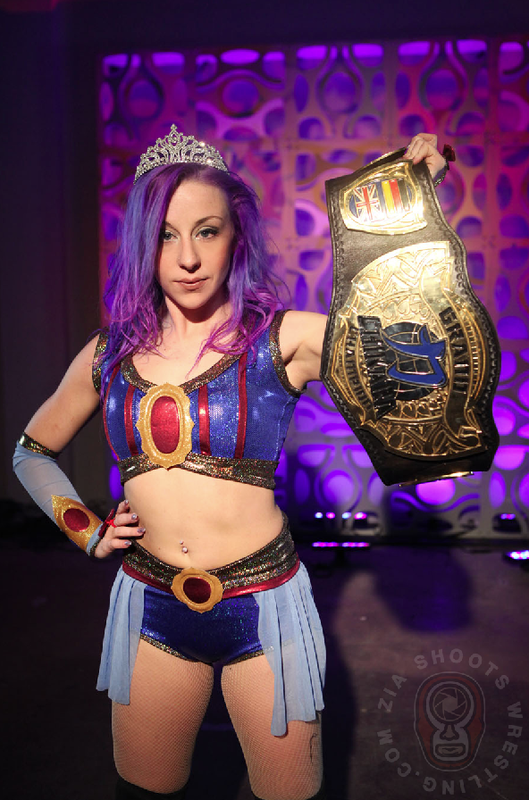 Kimber Lee winning the Grand Championship was satisfying and important for many reasons, not the least of which that now Chikara is open game for everyone to come out on top, not just ones born with a certain anatomy. And as an addendum, I don't know if the shock appearance of Archibald Peck means that he's coming back for a spell or if it was just tying up a loose end from the original shutdown time-travel story. But even if it's the latter, then kudos to everyone involved for the attention to detail which rarely is a thing that is tied to any wrestling company in a positive manner.